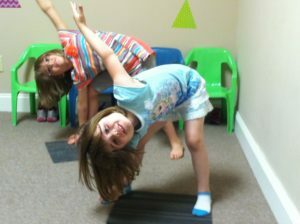 Improves Social Skills — Yoga provides a nice framework for social skills development. Partner poses force children to cooperate and trust one another. Decreases Behaviors — Because children have emotions that they cannot control, we see a lot of meltdowns during the early childhood years. By practicing breathing techniques and guided visualization during yoga, children learn to cope with their anxiety and frustrations. Provides Sensory Balance – Oftentimes, children with autism and special needs have a sensory dysfunction. Yoga is an excellent option for a sensory diet because it naturally provides both proprioceptive and vestibular input. Yoga music provides additional input for children who seek auditory input. Increases Imitation – Many children with special needs struggle with imitation skills. Yoga is a great way for children to practice those goals. Builds Confidence – The repetitiveness and consistency of yoga allows children to gain confidence in knowing the sequences while continuing to work on additional more challenging skills. Generalization — Yoga is portable! Once you learn the techniques of yoga, your child can practice poses, visualization, and breathing techniques at home, school, or in the community. Adult friendly — Having a child with special needs is exhausting. Yoga is a wonderful tool for parents to do alone or with their child to help relieve their own stressors. For more information about our yoga and meditation groups, go to social skills groups.